QT also has a real nice canvas implementation. It also will do some hardware acceleration and is pretty compatible with OpenGL . I had to write a VERY basic CAS for a my programming languages class. We used SML and it made the experience fairly straight forward. If you are planning on writing one from scratch you might want to consider writing it in a functional language. Just something to think about. I've had to do some web cam interfacing for a personal project. I've found OpenCV to work really well. As well as the code to interface with a web cam it also has a huge library for general computer vision programming. Topic: How to return to main function in C++? Re: How to return to main function in C++? I have seen beginner programmers write far worse first programs, so you should be proud of what you have made. Some things you might want to look into to improve your program. - formated input and output. SlyReaper wrote: ... And is that pointer notation on the third line? Yes it is a pointer. Since the array is dynamically allocated somewhere off in memory, you need to store the address of the first element of your array so that you can access it later. Topic: Cross-platform GUI toolkits - which? Re: Cross-platform GUI toolkits - which? I'd suggest taking a look at Qt.http://trolltech.com/products/qt They also have bindings for other languages if you don't want to use C++. I've been using Qt for several years now and i really like it. Qt is open source, and you should be able to download it directly from their site. I used Qt 3.x with windows and had no problems. I've only used Qt 4.x with linux, so i'm not sure how well it will work. Although trolltech puts out some quality products, and if they say it works, it should. Topic: Making pretty GUIs in C++ - how is it done? Re: Making pretty GUIs in C++ - how is it done? I don't think you need to have the bool* you just need bool active. 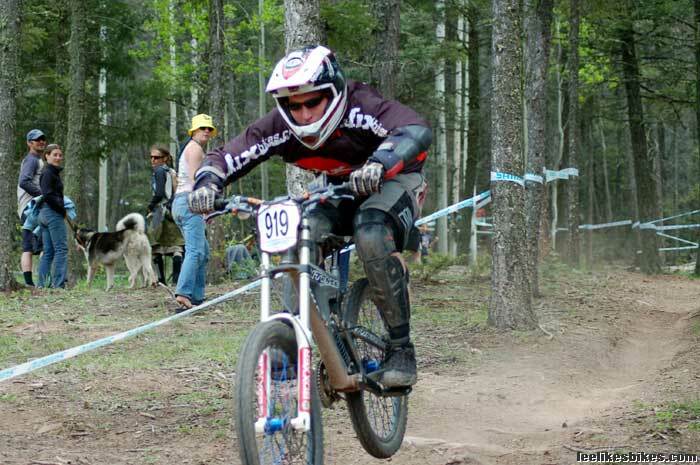 I race Downhill, 4X and dual slalom. I don't have any recent pictures of my bikes, but i have some action shots. http://www.leelikesbikes.com/wp-content ... DHmatt.jpg <- photo taken by my team coach from the Angle Fire NORBA National. Topic: what IDE on linux? Re: what IDE on linux? I've been using KDevelop for the last couple of years, and have found it to be a great IDE. While I agree, that you don't need more than a shell and gcc, an IDE can be nice. Vi, its what i started using, and will continue to use. Apparently Vi has its own gang sign now. Personally I have been using Suse since 8.1, now on openSuse 10.3, and i couldn't be happier. I found it to be a great distro to learn on, but no one seems to suggest it to people. Whats up with that? I've been a long time lurker, and the new religious wars thread has finally motivated me to post something. Anyway, i'm a college freshman who is majoring in Comp Sci. So ... yeah, greeting done.